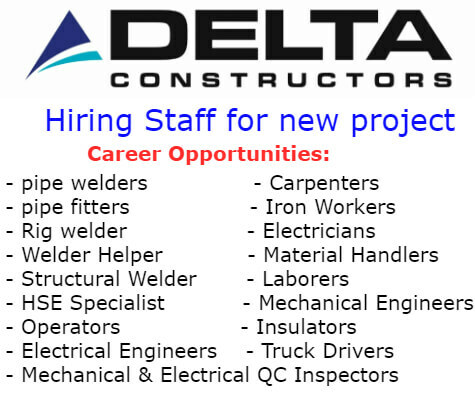 Delta company is committed to recruiting, cultivating and retaining qualified, highly motivated, talented, and safe individuals to bring value to clients. 3 years of experience as a Pipefitter. (Watford City, North Dakota, USA). past Experience oilfield operations as a Structural Welder. Experience with oil field materials handling. Previous experience as Materials Handler (preferred. 1 year of experience as a Laborer. 3+ years of experience as a Construction Field Engineer, preferably in the oil & gas industry or industrial construction. 2-4 years of engineering and quality control experience, or in relevant field preferred. Four years' experience as Pipefitter or Structural Craft Hand in an industrial oil field setting. Two (2) years' experience with light-duty vehicles. 1 year experience working in the oilfield as a laborer or other field position, preferred. Delta Constructors LLC provides construction, construction management, and commissioning services to the upstream and midstream oil and gas industry. The company measure success by delivering its commitments on time and on budget. Delta has established itself as the contractor of choice by providing the best quality job at the best value to clients, while setting the standard for safety. Employees are the most important asset and are a part of the Delta family. - All the links above will take you to the career page. There you can know more about your suitable job and easily apply online. 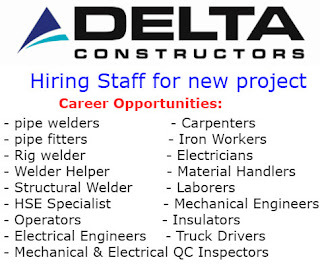 Delta Constructors LLC is an equal opportunity employer (Minorities/Females/Disabled/Veterans). Delta recruits, employ, train, compensate and promote without regard to race, religion, creed, color, national origin, age, gender, sexual orientation, marital status, disability, veteran status, or any other basis protected by applicable federal, state or local law.